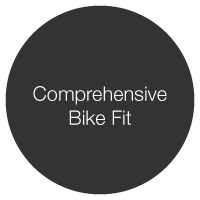 Take your performance to the next level with a Comprehensive Bike Fit from Plan 7 Endurance Coaching. Work with Dave Harward to make the most of performance and comfort on your bike. Dave has been trained by world class fitting experts from BikeFit Systems, Specialized BG Fit and Serotta. Plan to spend 90 minutes to 2 hours analyzing everything from your knee and hip angle to leg length differences and how forefoot varus influences your knee alignment while pedaling. We will find the right saddle to assist your upper body position hold neutral core strength. Your foot support also makes a significant difference in producing power efficiently and without pain. Depending on your individual needs we may us cleat shims and/or ITS (in the shoe) wedges to support your foot for maximum power transfer. Take your performance to the next level with a Comprehensive Bike Fit with Power Analysis from Plan 7 Endurance Coaching. Adding the element of Power Analysis allows us to see how changes influence your left/right pedal balance as well as the average torque angle as you apply power both left and right. Dave has been trained by world class fitting experts from BikeFit, Specialized BG Fit and Serotta and uses a unique method of analyzing power data and how your fit influences power production. Plan to spend approximately 3-4 hours analyzing everything from your knee and hip angle to leg length differences and how forefoot varus influences your knee alignment while pedaling. We will use cleat shims and/or ITS (in the shoe) wedges to make sure we have your foot supported for maximum power transfer.